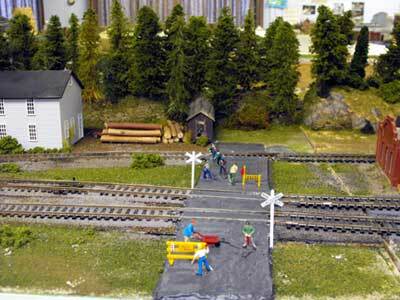 I was rushing to install a road and crossing mini-scene on the Nottawasaga Model Railroad Club layout because we were adding scenic touches before the modules went on display at a regional train show. We didn't have any hydrocal or Scultamold handy but there was some leftover drywall compound in a bucket. So I scooped some out, grabbed a spreader, and went to work. All went well as I built up the road on either side of the tracks. I put in a couple of pieces of stripwood to keep the flangeways clean. The roadway is about 21' scale feet wide which is about right.Then we all packed up for the night and went home. The following week when we returned to the club I found that the drywall compound had cracked because I had troweled it on too thick. I had a lovely road that was a disaster. The train show was the following week. There wasn't time to rip it out and start over. So I created this scene. Painted the road with some dark gray latex house paint. Rifled through the odds and ends box that we all have and found some plastic details I received as a stocking stuffer a few Christmases ago. One of the other members had a few construction type trucks that looked pretty good even if they weren't quite scale size. Presto. Saved from disaster. Off we went to the train show. Everyone stopped to admire the roadwork and comment on what a great idea. Return from "mini-scene" to my Home Page.